With the strong but very warm winds still blowing seawatching was the order of the day. Nearly eight hours of observations produced a Pintail, 2000 Gannets, four Great Skuas, 36 Arctic Skuas, 474 Mediterranean Gulls, 410 Kittiwakes, 225 Sandwich Terns and two late Black Terns of note, mostly passing westwards. A first-winter Caspian Gull was seen on the beach at the fishing boats this afternoon. A few Song Thrushes were seen in the bushes and 1700 Goldfinches and 250 Linnets passed through. 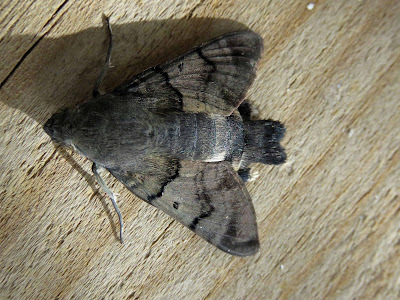 The moth traps were very quiet in the windy conditions but a Hummingbird Hawkmoth was seen in the field and the caterpillar that was found on Sep.12th also hatched out. 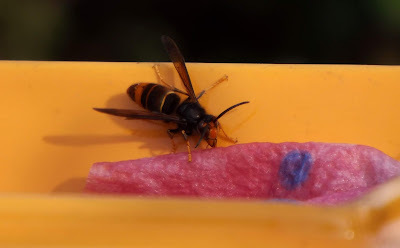 The saga of the Asian Hornet continues with a male seen in a private garden and then it/or another individual was trapped not far away in the lighthouse garden.